According to Russian state owned news agency TASS citing a spokesman for the United Shipbuilding Corporation (OCK), Russia’s future aircraft carrier Project 23000E "Storm" will have to be equipped with a nuclear power plant. A nuclear powered Project 23000E Storm aircraft carrier may displace 80,000 to 85,000 tonnes with some 70 aircraft on board. "The project of a future Russian aircraft carrier, or as it is sometimes referred to as naval aircraft carrying complex, is in the design phase. Research conducted by the Nevskoye Design Bureau indicates that the sole way of meeting the Navy’s requirements, such as power generation, sea endurance and voyage range is to equip the ship with a nuclear power plant," the source said. The Nevskoye Design Bureau has worked on the project since 2007, the corporation’s official said. At the Defense Ministry’s request it has proposed the image of the ship and its air wing and determined the list of research and development works and requirements for its future base. The source pointed out that by now the possibility has been confirmed in principle of building the aircraft at one of the corporation’s shipyards and determined the main sub-contractors, the cost of the project and delivery date. The state defense contract envisages no aircraft building projects for now. "The current state defense contract for 2015-2017 contains no plans for creating a naval aircraft-carrying complex," the source said. Earlier, the Nevskoye Design Bureau’s CEO, Sergey Vlasov, told TASS that the corporation was pushing ahead with research into an aircraft carrier of the future entirely of its own accord, without any terms of reference from the Navy to rely on. Vlasov speculated there may be two projects: a nuclear-powered ship with a displacement of 80,000-85,000 tonnes and some 70 aircraft on board. 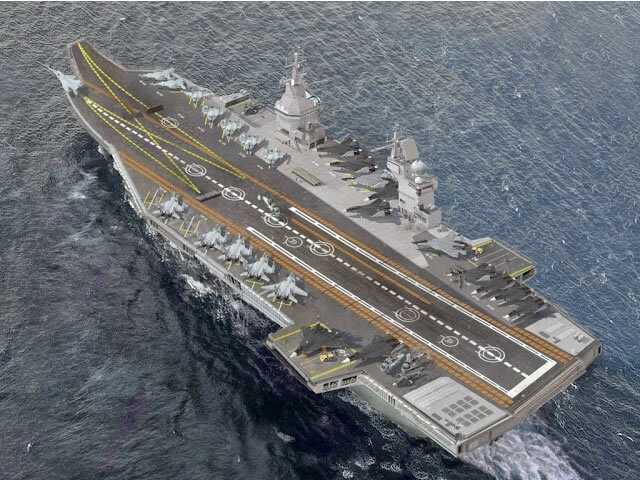 A non-nuclear aircraft carrier having a displacement of 55,000-65,000 tonnes will be able to carry 50-55 aircraft. Image showing Krylov Central Scientific Research Institute's Avalanche (Lavina) Project with the official seal of the Russian Navy. A spokesman for the United Shipbuilding Corporation said Russia’s shipbuilding industry has not yet received from the Navy the terms of reference for a new generation amphibious assault ship. "The industry has no terms of reference at this point," the source said, adding that it would be a dramatically new ship. The United Shipbuilding Corporation is undergoing fundamental technical upgrade. When completed, it will enable the USC to build advanced ships for the Russian Navy," the source told TASS. Earlier, the Russian Navy’s commander, Admiral Viktor Chirkov, mentioned plans for designing large amphibious assault ships of the future capable of carrying a dozen helicopters and 450 Marines. The Defense Ministry said the first new generation amphibious assault ship will be delivered by 2020. The ship’s displacement is estimated at 16,000 tonnes. The Navy’s officials said the image of the ship had been formed, while the USC remarked that the plans had not gone any farther than preliminary sketch design. 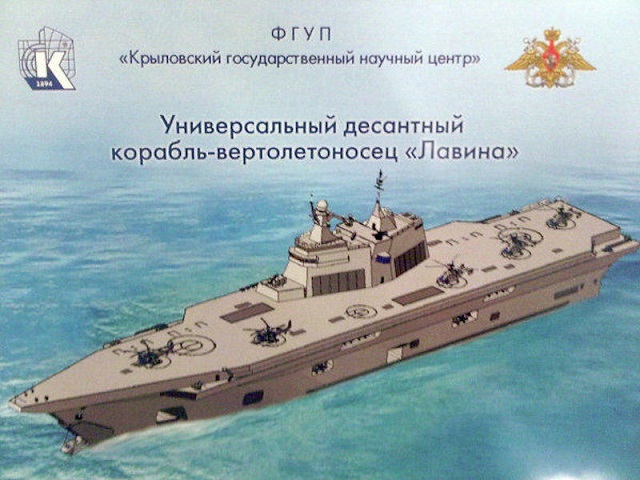 The shipbuilders said that Russia’s future amphibious assault ships were in the project concept phase. Each such ship will take less than five years to design and build. At the international naval show in St. Petersburg in July Admiral Chirkov told the media that the yet-to-be-created ship would carry 16 helicopters, an attack force of 450 men and 80 armoured vehicles. It remained unclear whether the concept had anything to do with the amphibious assault ships that are being developed. During the ARMY-2015 defense exhibiton in June, a new project called "Avalanche" was unveiled: Krylov State Research Center developed the Avalanche project of amphibious assault ship as a replacement for the cancelation for the Mistral class deal with France. Severnoye Design Bureau Project 21956 class destroyer. In early July, a shipbuilding industry source told TASS that the nuclear power generating facility for the propulsion system of Russia’s future aircraft carrier will be worked out on the Lider (Leader) class destroyer. The Russian Navy plans in the future to obtain new aircraft carriers, but the timeframe for the construction this class of vessel is unknown. The Navy has said that a prospective aircraft carrier will be built no earlier than in 2030. Last week Russia and France agreed to discontinue the contract for the supply of two Mistral helicopter carriers ordered for the Russian Navy in 2011.